US Dropped Record High Number Of Munnitions On Targets In Afghanistan Since Start Of 2018 5 out of 5 based on 4 ratings. 4 user reviews. 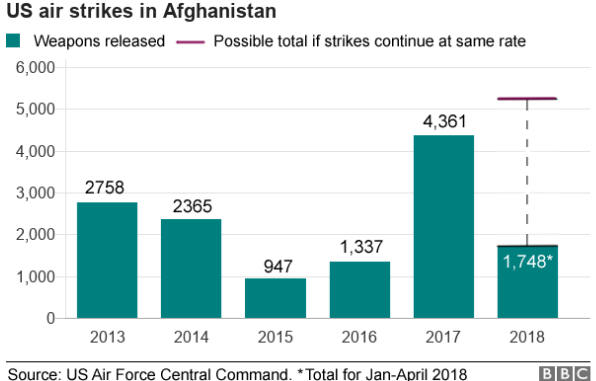 Since the start of 2018, the US has dropped a record high more bombs and other munitions in Afghanistan in comparison to any other full year since documentation began in 2006. Accordng to a report by US Air Forces Central Command, US forces used 5,982 munition in the period from the start of the 2018 to the end of October. Coalition aircraft flew nearly 6,600 sorties, about 12% of which carried out strikes during that period. The increased bombing campaign is a part of the strategy of the administration of President Donald Trump to defeat the Taliban in the war-torn country. However, this does not help. The Afghan movement has been steadily expanding its influence across the country. The US-led coalition and the Kabul government are also incapable of securing the areas, which they control, including the capital of Kabul. Multiple attacks on government forces within the “government-controlled areas” show this. after so many years of war, so many lifes lost by cooalition forces we are back at were we began. Just judging by the above listed number of sorties and bombs/missiles deployed, the US and its “partner” stooges and lapdogs do not want to totally defeat their enemy. Yes, i used the word “enemy.” Has anyone ever heard the presstiute media use that word? To the thinking person, it is obvious that they want this war to continue until Antartica melts since the Taliban still control ~ 45 % of the country. After all, peace is bad for the military equipment supplier whore master pimps.